"The slight misdeed of yesterday, why should it mar today? The thing he said, the thing you did, have long since passed away; For yesterday was but a trial; today you will succeed, and from mistakes of yesterday will come some noble deed. Forgive yourself for thoughtlessness, do not condemn the past; for it is gone with its mistakes; their memory can not last; forget the failures and misdeeds, from such experience rise! Why should you let your head bowed, Lift up your heart and eyes!" That is so powerful! Read it a few times. Savour it because it can change your life. People will hurt you, lie to you, play you, mislead you, cheat you, use you, etc... and you at some point in your life will or have done the same to others. That is life and we are human. The key is to recognize it and stop the behaviour, we have a conscious and to be nice should be common sense. Being emphatic of others is important. Treat others the way you would like to be treated. When you forgive and not hold a grudge a heavy weight is lifted off your shoulders, your heart gets clean. Therefore you are happy. Forgiveness does not excuse their behaviour. 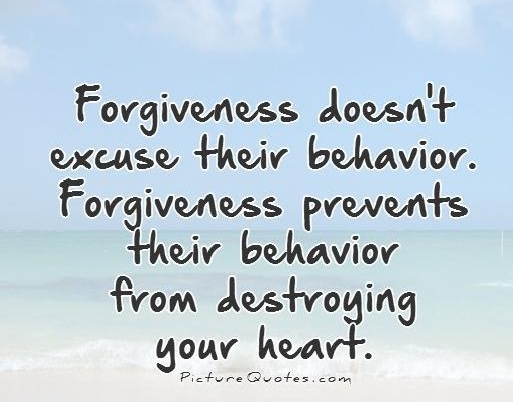 Forgiveness prevents their behaviour from hurting your heart. Knowing this now, start applying this within yourself. You will see that to remain upset, hold a grudge, only makes you sad, unhappy and angry. Use your energy on positive things in your life for yourself. Stop letting others actions dictate how you feel! Be the better person, lift up your heart and lead by example. You have this choice! My advice to you. With love and gratitude. This is something that I do every single day. Since the very first day a very wise friend of mine told me to do this I did and it changed my life. I will share this with you because it works. So, just try. Every day in the morning be grateful for 10 things in your life. What this does is puts you in the mind set of happiness and appreciation. By recognizing the good that surrounds you, you feel content. Great way to start your day! After your gratitude affirmations, be still and ask for guidance for the day. The first thought that comes to mind, follow that thought or feeling. That is your gut. You must trust it. Last but not least and most challenging is send love to those who bother you. Try this and please let me know how you felt after. This is how you do this, sit or lay down in quiet and think of those whom you are not happy with. Anyone that you are not in a good place with. Send them love. This does not mean that you agree with their behaviour but what this does do, it liberates you from that ugly feeling of discomfort and discontent that takes place in you heart when you do see them or think about them. After practicing this a few times you will notice that the relationship with those specific people starts to shift into a more positive state. At least from your perspective the relationship will start to heal, leaving you and your heart cleared from ugly resentful thoughts and feelings. When you get to this place you will send that vibe to them whether you are in their presence or not and automatically they will no longer play a negative bothersome part in your life. If you have any comments on this or need more insight please feel free to talk to me.